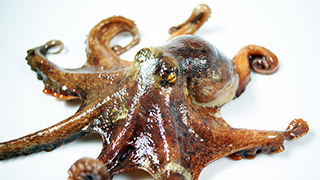 Octopuses are soft-bodied sea creatures with eight arms, each having a large amount of suction cups that allow them to have a very strong grip. They have excellent sight and are known to fit through very small holes due to their soft bodies. The inhabit various regions in the world's oceans, while some live in the coral reefs close to the surface, there are also species that prefer abyssal depths. They can defend theirselves against larger hunters by spraying ink and quickly swim away while out of sight.